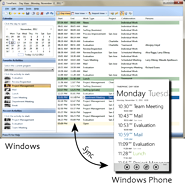 Time management software for Windows and portable devices - effective time management with TimePanic. Simple, intuitive and free to try. Start managing your time today. Time is one of the most important assets you have. Learn to manage it effectively and you will get more done, stay on top of your deadlines, improve efficiency and boost your productivity. All of which can be achieved without having to spend more time at work. In fact TimePanic can help you get the same amount of work done in less time. Let TimePanic put you back in control of your working and private life. Download our free 30 day evaluation version for yourself, and see what this time management software can do for you. For more testimonials regarding our time tracking software, please click here.